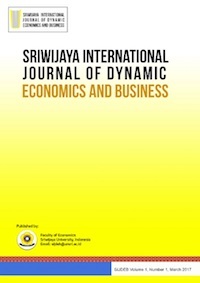 Sriwijaya International Journal of Dynamic Economics and Business (SIJDEB), p-ISSN 2581-2904 and e-ISSN 2581-2912, is an international journal established and managed by Faculty of Economics, Universitas Sriwijaya. It is a peer-reviewed journal published four times a year (March, June, September and December) and intended to be an international journal that publishes scientific paper in the field of economics, business and accounting. SIJDEB is expected to be use as a reference for academicians in writing a scientific, relevant and dynamic article to enhance new generation that are fond in writing academic paper.